This vegan roasted garlic cauliflower soup is creamy, silky smooth, and oh-so-soothing. It requires just 15 minutes or so of active kitchen prep, and comes together rather effortlessly. Cauliflower and garlic are dry roasted until golden-brown, simmered in broth until tender, and blended until smooth + creamy. 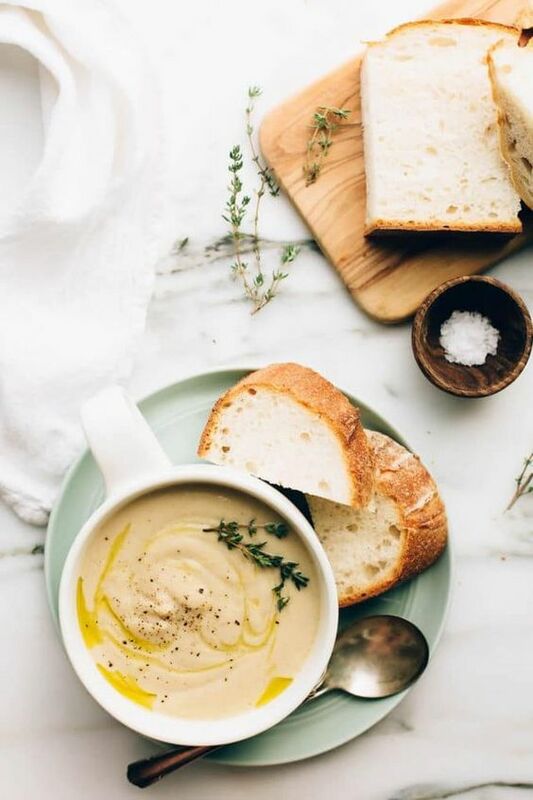 This vegan roasted garlic cauliflower soup is creamy, silky smooth, and oh-so-soothing. It requires just 15 minutes or so of active kitchen prep, and comes together rather effortlessly. Cauliflower and garlic are dry roasted until golden-brown, simmered in broth until tender, and blended until super smooth and creamy. Preheat the oven to 425F. Line a large baking tray with parchment paper. Spread the cauliflower florets and garlic cloves out over the lined baking tray. Dry roast the cauliflower and garlic for 30 to 40 minutes, or until the cauliflower is flecked with a rich golden-brown hue. Meanwhile, about 10 minutes before the cauliflower is ready, heat the olive oil in a large stockpot or dutch oven over medium-low heat. Add the onion and thyme sprigs and sauté for 5 to 7 minutes, or until the onion is soft and translucent, stirring occasionally. Once the cauliflower and garlic have finished roasting, add them to the stock pot along with the vegetable broth. Increase the heat to medium-high and bring the mixture to a boil. Then, reduce the heat, cover, and simmer for 15 minutes. Turn off the heat, and carefully remove the thyme sprigs. Use an immersion blender to purée the soup. It will take about 5 minutes or more to get the soup completely smooth, so just keep blending until the texture reaches the desired consistency. Stir in the almond milk, nutritional yeast, apple cider vinegar, sea salt, and black pepper. Use the immersion blender to briefly blend again. Then, taste and adjust seasoning, adding more sea salt and black pepper if desired. Ladle the soup into bowls and serve warm with a drizzle of olive oil, if desired. *Ensure that your almond milk is plain, unsweetened, and free from "natural flavors". Some brands of almond milk (e.g., Califia) add "natural flavors" to their plain/unsweetened almond milk that, to me, impart an undesirable sweetness in savory dishes that's difficult to overcome even with added salt and seasonings. 0 Response to "VEGAN ROASTED GARLIC CAULIFLOWER SOUP "